Visiting barber’s shop every now and then and waiting for free chairs at hairdressing salon can be a painstaking task. Even the barbers complain about the awful tools and blades for hair cutting. To get rid of all these, a master hair clipper is the best solution. A hair clipper allows you to cut your hair evenly with least efforts. A hair clipper has sharpened blades, which, oscillate with the manual or electrical mechanism. The master hair clippers are driven by electric motors. Yes, you read that all right. All your problems will be going away with owning a master hair clipper. One of the reputed brand Andis is a leading provider of hair clippers and trimmers. Andis has been one of the favorites in this field over 90 years. Andis hair clippers are known for cutting, styling and grooming like no one else. This product comes up with multiple features, which would compel you to buy this master hair clipper. The Andis master hair clipper has the most desirable features. To help you decide better, I have listed all of them. So check if it is the product you have been aching for. The Andis is known for its awesome hair cutting and trimming tools. Andis products are the choice of professionals. They are meant to last long. The quality factor has been their top priority. The brand value with its robust structure is definitely superior compared to other average clippers. The master hair clipper is an example of well-engineered hair trimmer. The system is neatly designed. All the factors including performance and comfort are considered. The product suits every hand. The exclusive design allows the master hair clipper to do all around cutting and tapering. The master hair clipper has the excellent build quality levers. They are situated on the sides; they can be placed to move with our thumbs. Such levers allow you to change the length of the cut by sliding one hair clipper blade along the other. Aluminum is a very light metal. The use of aluminum reduces the dead weight and the consumption of energy. It is highly corrosion resistant. Hence, aluminum housings well protect and conserve the product. The aluminum housing is made durable and long lasting by modifying the composition of its alloys. This safeguards the master hair clipper. 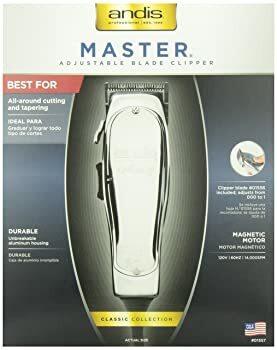 The master hair clipper has professional standards, as it is highly durable and robust product, which is of utmost importance for long-term use at barber’s shop. It is well designed for the professional hairdressing. The carbon steel blades are stronger than the stainless steel blades. They are easier to sharpen. It keeps them sharp for longer usage. The carbon-steel blades make the master hair clipper long lasting and less enduring. 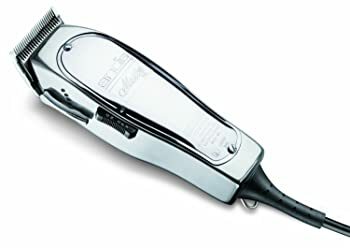 The master hair clipper has magnetic motor clippers. Such kind of motors is ideal for occasional use. They provide a high-quality cut at an adequate price. Magnetic motors provide high speed as much as 14000 strokes per minute. They produce smooth haircut. They suit best for high volume hair cutting. The master hair clipper is pretty light with a weight of 1.25 lbs. as against the heavy clipper counterparts. The body of the hair clipper is made of Aluminum. It is around 6 inches long with a magnetic motor, which gives 14000 strokes per minute. The 120 volts supply is needed with a frequency of 60 Hz. The blades are made of carbon steel. The Andis Master Hair Clipper, Silver (01557) has set of pros and cons, which are listed below for your buying guide. Precise cutting: The master hair clipper is really a master in the department of cutting and tapering. It cuts very clean and even. It will feel like cutting butter. The all-rounder trimmer allows the outlining and fading of the hair. Cool and quite: This is an important feature, which is hard-to-get. No barber would like to annoy the customers and no user would like to own a noisy hair clipper. But this one stays cool for short span usage and it is pretty quiet compared to other noisy clippers and trimmers. Durability: This is a major plus point of this master hair clipper. The unbreakable aluminum housing safeguards the hair clipper. The carbon steel blades are long lasting. And the body is made up of high-quality polymer, which makes the device live longer. Budget friendly: Looking at the benefits the product provides, the cost looks reasonable from the buyers’ point of view. This price will suit every budget. It gives more at fewer prices. So the price is adequate for the customers. Maintenance: Maintaining this hair clipper could be laborious. The timely lubrication is necessary for proper functioning of the product. The blades need to be oiled regularly. Gets hot: The master hair clipper can get hot if used for more than 30 minutes continuously. It is advisable to use it for a short period of time so that the cutting blades can be cooled down. Discomfiting: The master hair clipper could be little uncomfortable for people who cannot bear the weight in one hand. The barbers are a pro at this skill so they would not face a problem. But the occasional users may find it heavy. The Andis Master Hair Clipper, Silver (01557) is the best choice for dry cutting any type of hair, free handing beards, fads, flat-tops etc. The well-integrated carbon steel blades are adjustable for fine or rough hair. The aluminum casing is lightweight yet durable. The high-speed magnetic motor consumes less power and gives the required result. The master hair clipper shall free you from snagging, pulling or uneven cutting of hair. The best feature is the adjustable blades and closed teeth that suit each kind of hair. So, the pros are overweighing the cons and hence you should not resist buying this amazing product. The Andis Master Hair Clipper, Silver (01557) gives you the best hair-cutting experience. This master hair clipper is robust yet lightweight in terms of design. It can easily withstand the everyday wears and tears. The lightweight aluminum casing with a polymer body makes it sustainable. The high-speed magnetic motor cuts the hair in no time. The carbon steel blades are adjustable and long lasting. The levers on the sides give easy operation. The hair clipper meets the professional standards and if used properly, it causes no problems at all. So it’s time to make this one-time investment and say goodbye to time-consuming barber appointments.